The exhibition entitled “Bernini’s School and the Roman Baroque” opened at the Georgian National Museum in Tbilisi on September 10 and continues until November 26, 2018. 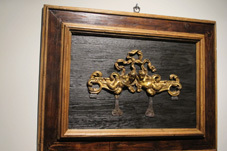 Organized by the Italian Embassy in close collaboration with the Georgian National Museum, and implemented by the Georgian Governmental project Check-in-Georgia, the exhibition displays the artworks from Palazzo Chigi in Ariccia. Presented are about 60 works including painting and graphic portraits, self-portraits, landscapes; bronze medals and medallions, palace decorations, leather and silk hangers, decorative lamp; Preparations for frescos designed for religious buildings, etc. Francesco Petrucci, the curator and director of Palazzo Chigi in Ariccia spoke about the exposition and Chigi Palace, which was redesigned by Gian Lorenzo Bernini - Neapolitan sculptor, painter and architect (1598-1680), who has turned it into a residence of the Noble Chigi family under the authority of Pope Alexander VII. The city of Ariccia is located very close to Rome and thanks to the creativity of Bernini it has a beautiful Baroque heart, which is Chigi Palace. Bernini transformed the Palace into a magnificent baroque residence, with the unique architectural mix of Roman villas, representing an exquisite example of Baroque home and documenting the prestige of one of the greatest Italian Papal dynasties. “Baroque art is an artistic expression of the 17th Century Europe, it is art of the communication, the artists of Baroque art want to speak to everybody, to simple persons as well as to cultural persons with very simple words, only with images”, said Mr. Petrucci. Gian Lorenzo Bernini, who had multifaceted talent, is considered as the star, the prince of Baroque. “Bernini’s idea was to connect all the hearts, to make the fusion, the unity of all the hearts to communicate better and he had many collaborators, sculptors, architects, artisans who worked with him and followed his ideas,” added Petrucci. The exhibition brings the viewer to the 17th century Italy to see the luscious and fascinating manner of expression typical of that period, the genres and styles that defined the baroque aesthetics and forged the communicative apparatus, both moral and spiritual, of the Catholic Church. The Georgian National Museum invites the visitor to see the masterpieces of Bernini and other Italian masters of the 17th Century, such as Giovan Battista Falda, Jacob Ferdinand Voet, Giovan Battista Gaulli, Alessandro Mattia da Farnese, Francesco Trevisani, Giuseppe Cesari, Jacques Stella, Jean Lemaire, Giacinto Gimignani, Giovanni Battista Salvi, Mario Nuzzi, Luigi Garzi, Domenico Fetti and many more. The official opening of the exhibition was attended by the representatives of Georgian media, artists, curators, art historians/critics, the Italian Embassy in Georgia, the Ministry of Education, Science, Culture and Sport of Georgia, Georgian National Tourism Administration and other members of the public. This exhibition is another step forward taken by the Georgian National Museum starting with the purpose of introducing the Georgian public to the genesis of Roman Baroque and providing closer access to the history of Italian art of this particular period by offering educational programs and public lectures at the Museum. The importance of the exhibition was also well underlined in the opening speeches delivered by the Director of the Georgian National Museum David Lordkipanidze, the Minister of Education, Science, Culture and Sport of Georgia Mikheil Batiashvili, H.E. Ambassador of Italy to Georgia Antonio Enrico Bartoli and the Head of Georgian National Tourism Administration Giorgi Chogovadze.